The villa is a 10-15 minute walk from Sosa town and beach, and its location is convenient for individuals or families with kids to explore the North Coast of the Dominican Republic. 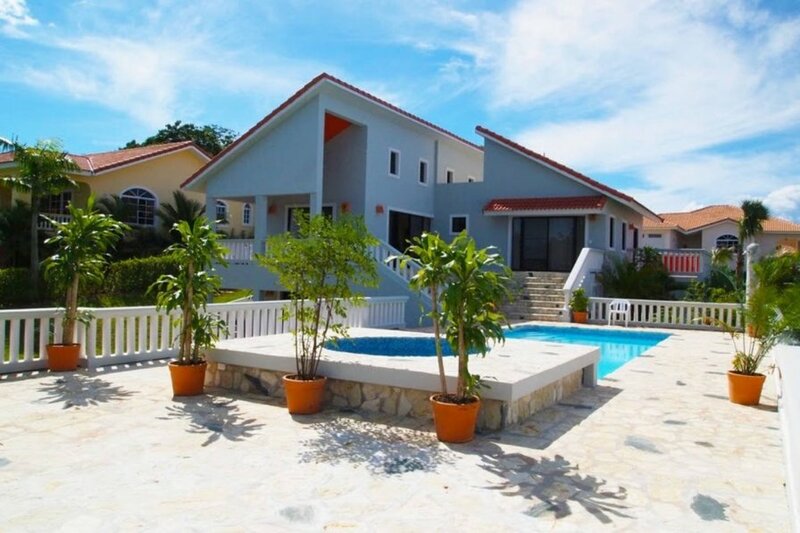 The villa is located within Residencial Hispaniola, a beautiful gated community with 24-hour security, cable with 65 inch LED TV, electricity, water, and wireless internet. A team of fine artist and graphic designer based in NYC designed this modern two-story villa, including the furnishings. Each room is tastefully designed with a blend of zen and contemporary themes. The dynamic architectural details of this villa are one of the most unique ones you will find in this gated community. You can chill out in the villas private swimming pool and enjoy the ocean view. This villa is great for couples that want to have a romantic getaway. The villa is a 10-15 minute walk from Sosa town and beach, and its location is convenient for individuals or families with kids to explore the North Coast of the Dominican Republic. Some of the amenities within this gated villa community includes a tennis court, a basketball court and a large childrens playground. Daily maid service is provided to clean the villa and wash the dishes.Residencial Hispaniola + Sosa: Residencial Hispaniola is a gated community located with 24-hour security.Getting around in Sosa is very easy and many restaurants, bars, clubs are walkable distance. The gated community of Residencial Hispaniola is fairly large so it will take about 8-10 minute walk from our villa to the security entrance.But after you get out of Residencial Hispaniola, you just need to walk down the small hill about 5 minutes and youll be at the main road. 1 block across from the main road is where you will find bars, restaurants, etc.Sosua Beach is about 8 12 minute walk after you get out of Residencial Hispaniola. There is a large supermarket on the main road as well.Residencial Hispaniola has many hills so it would be convenient to have a car especially if youre shopping. There are many motor-bike taxis and regular taxis in Sosa if you dont have a car.Regular taxis can take you back to our villa but the motor-bike taxis are not allowed to enter the security gate so if you need a ride all the way back to our villa, take the regular taxi.There are many public transportation options in Sosa to take you to various towns such as Puerto Plata, Cabarete, Santiago and many others.